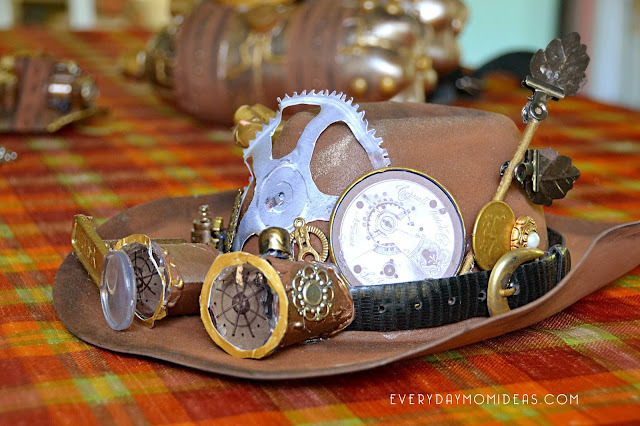 My favorite thing about creating Steampunk accessories is that its such an open artistic concept. Really so much can go into the look. Trying to think of ways to mix the old with the future is a creative person's dream. The possibilities are endless. We used things around our house and even used old containers, lids, and cardboard we were going to throw out. 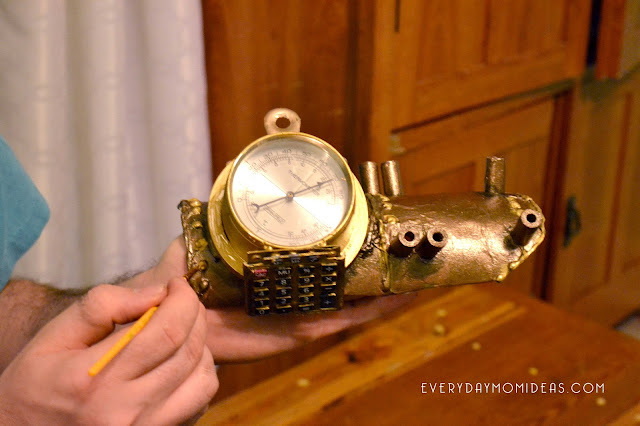 Talk about upcycling. 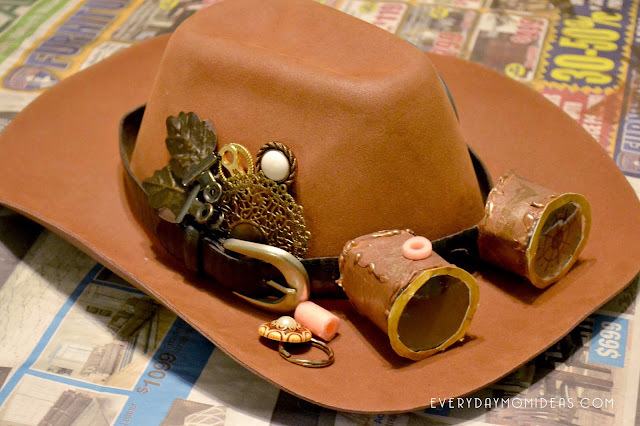 For the hat we bought at the dollar store we used an old kid belt and button and clips for the accessories. 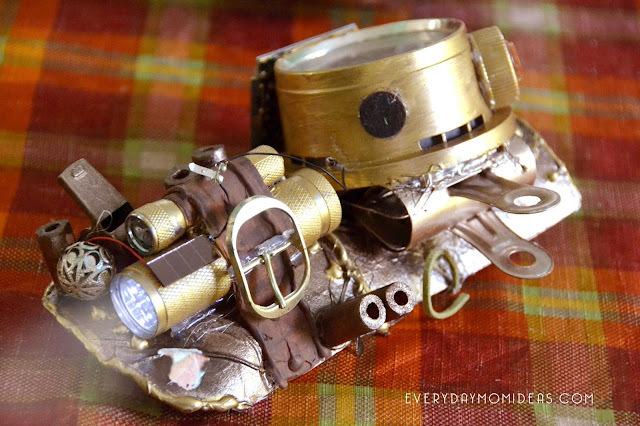 We used toilet paper rolls for the goggles and plastic from old containers for the lens. Nerf gun bullets come in very handy for making knobs, gears, pipes, and bolts. 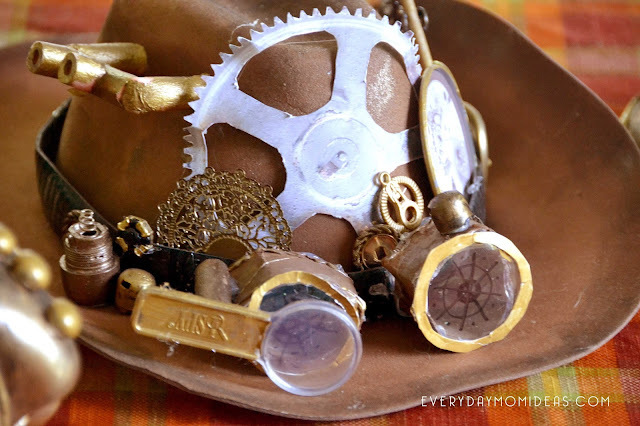 We also printed off some cogs for the hat and accessories. The cog on this picture is bent because this was a costume we did last year and it must have been smushed in storage. No biggy. I can just print off another cog if we want to use this hat again. 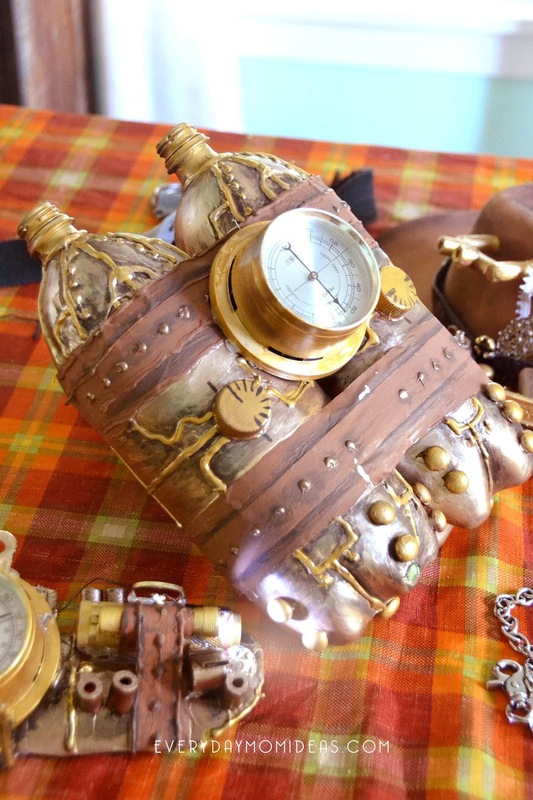 The Steampunk wristband was a really cool touch and doubled as a Halloween working Flashlight. The base was made with a leftover cardboard tube. We added the nerf gun foam bullets for pipes. 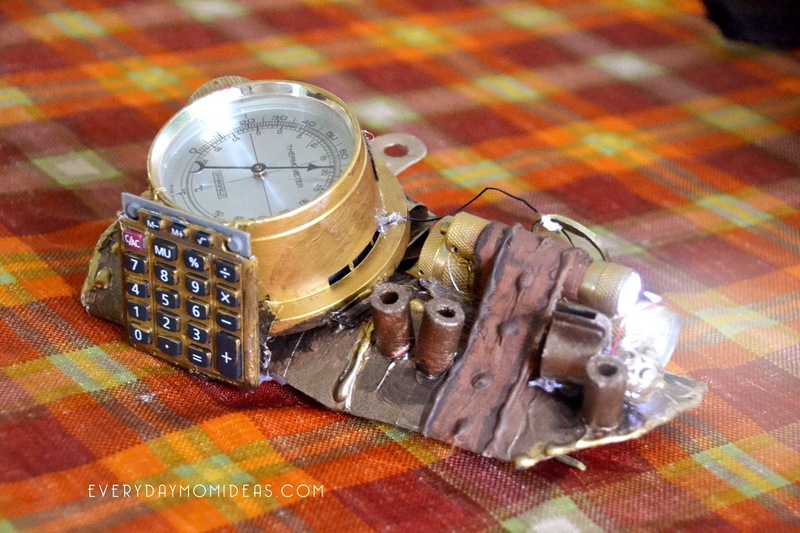 An old calculator that didn't work came in very handy. We took it apart and used different parts of it throughout the wristband. Then added flashlights and a whistle. We used painter masking tape and glue from a glue gun for the leather strap look. To secure the wristband to the arm we just attached leather stips to tie on. The jetpack unit was a lot of fun to make as well with using two soda bottles, a glue gun, and some imagination. 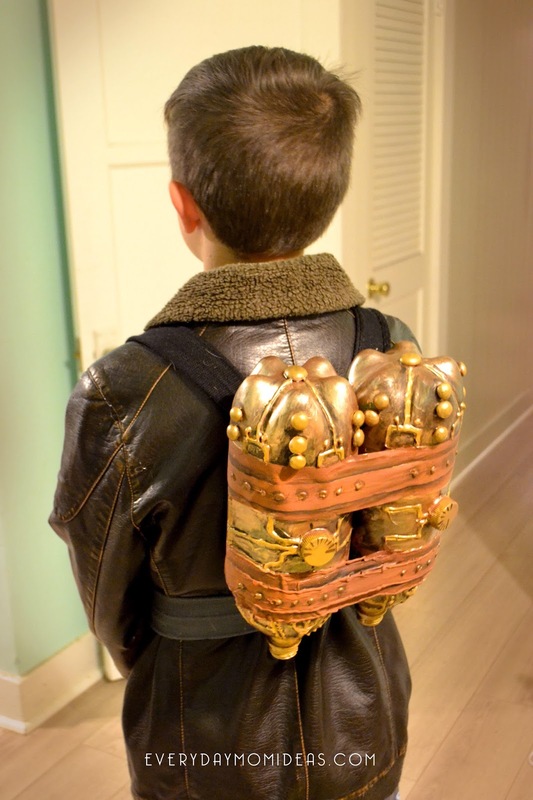 Get the full step by step tutorial for the jetpack here at a previous post. The pocket watches a quick little project. 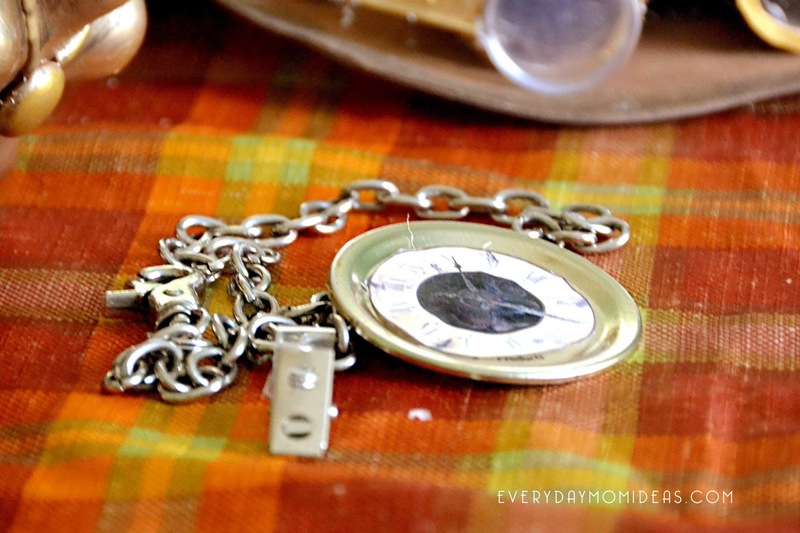 We used an old jar lid part and lanyard for its clip and a chain. All we did was print off a picture of a clock face and glued it onto the lid piece. 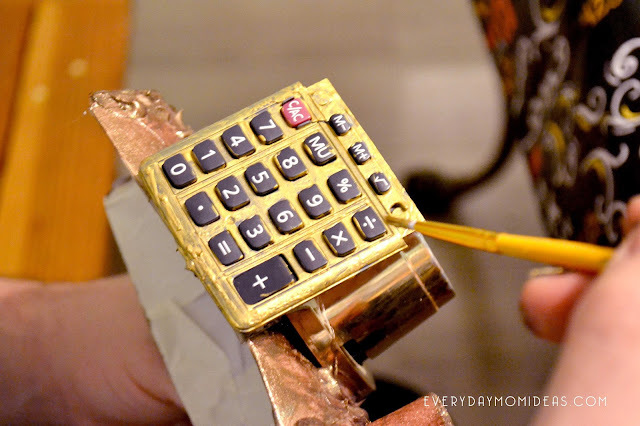 TIP: if you would like to use your DIY timepiece more than a few times I would decoupage the clock face onto the lid. That will help it be more durable and water resistant. We did not have to come up with a bunch of fancy clothes because all the accessories added a lot to the overall look. Basically just used my sons bomber jacket and his regular clothes. He ended up being a steampunk sheriff from the future. 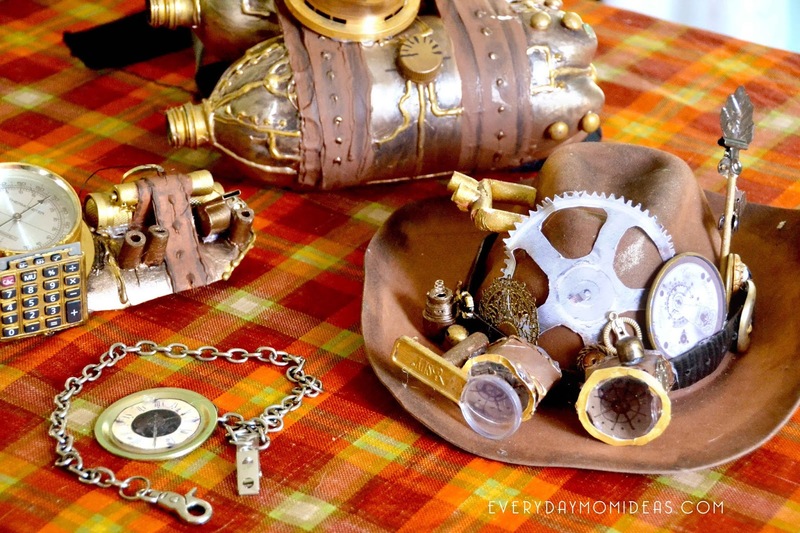 I hope this helped get your creative steampunk ideas going. Please let me know if you have any question I am happy to help.